In class, a point made about subject quality: a sample is good if it is appropriate to the question being asked. You cannot legitimately criticize a study for “only using college students” (or whatever) unless there is a articulable reason to think that the sample is inappropriate to the particular inquiry. And often there is such a reason, but frequently the objection is formulaic and in service of some other agenda. Analogously for game design: a system is good if it is appropriate to an audience (or can be misused, misunderstood, or corrupted in a way that is appropriate to an audience). The second case is “hacking” in both the traditional using for a purpose other than originally intended and the RPG modifying slightly senses. Maybe this is obvious? In any case I found the comparison useful to think about, given how often “good design” is conceptualized as some sort of independent quality. Aside: you may have noticed the relative dearth of posts lately. This corresponded with the beginning of grad school, which seems to be somewhat time intensive. Who would have thought? I do not intend to disappear completely, but expect the frequency to remain lowered. This entry was posted in Uncategorized on October 16, 2014 by Necropraxis. * It’s good if it matches or is very close to the designer’s intentions. This may be hard to determine because we usually we can only make inferences based on the game’s text. For instance, if I designed a game about heroes accomplishing great deeds, the system would need to support it. * It’s good if it corresponds to the GM’s vision of the game. There may be structural issues that ultimately hinder a game to be used in a specific way the GM intends to. 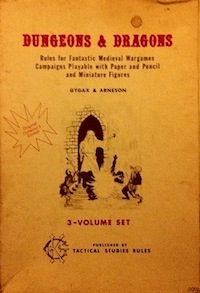 This may be trivial in some cases (Vampire is a bad choice for exploration-based sandbox games), less so in others (4E’s combat system may be easily reskinned as a wuxia game, but it’s other aspects may not fit wll; or OD&D played straight does Lord of the Rings quite badly because of its underlying assumptions). This is more problematic because each game may be “good” or “bad” depending on the specific campaign. * It’s good if people enjoy it. The least objective of all – although the easiest to tell. When I speak of good design I usually mean the first, but many people might word it differently or have their own idea about “good design” in general. Your audience-based criteria is interesting, most similar to my second alternative, I think, but much less wordy and more easily explained. On the other hand, that also doesn’t mean that a design X that works for group Y wouldn’t be even better for them, tweaked and iterated to X’ or even replaced with Q. Good luck with balancing grad school and… anything else in your life! If you want to keep blogging, I suggest trying to set yourself a schedule – self-imposed deadlines – and working the rhythm of it into your overall time management. I was on a hiatus of months and months until this summer when I made myself start up again. Seriously, though, good luck – especially if you’re teaching. Grading for anything but the smallest and coziest of seminars/workshops is drudge work. Good luck with grad school! Shame about the diminished posts, I’m a huge fan. Yep. Coming at it the opposite way has sometimes been described as “game X is always right.” That is to say, coming at a game without expectations in order to see what it does well; you might not find a game that suits your own needs, but you’re more likely to find out who’s needs the game will serve.